Hazuki was fantastic to work for and around, she is a very caring and understanding person and made me feel so welcome during my time at her hostel. This was my first workaway experience and it was great, along with being a fantastic host the hostel itself housed many guests in my time who I was fortunate enough to create bonds with, upon learning of a couple of key locations in the Hiroshima area I would take some of the guests to the local temple or to Miyajima island for hiking tours something I never thought I would do and I am so grateful for the chance I was given to do so. 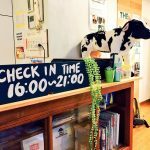 The work schedule is very flexible allowing you plenty of time to experience Hiroshima life in going out and travelling or spending it with local members of the community who sometimes come by to the hostel as well. I am thankful the opportunity I was given to work with Hazuki and I highly recommend this work away to anyone looking to spend time in Hiroshima, its central location, friendly staff & guests and flexible work schedule make it ideal for anyone.